I wrote about collector Barton Currie, author of Fishers of Books (1931) in an earlier post. He is a highly quotable guy and I jotted a number of quotations down while re-reading his classic work. You'll find them below. 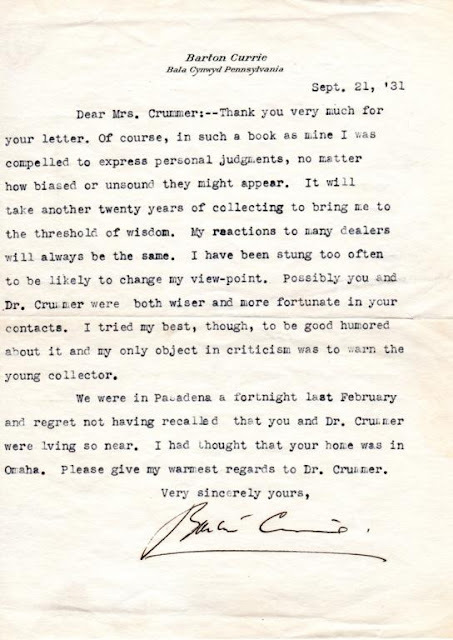 I also serendipitously came across two more nice Currie association items shortly after my original blog post. 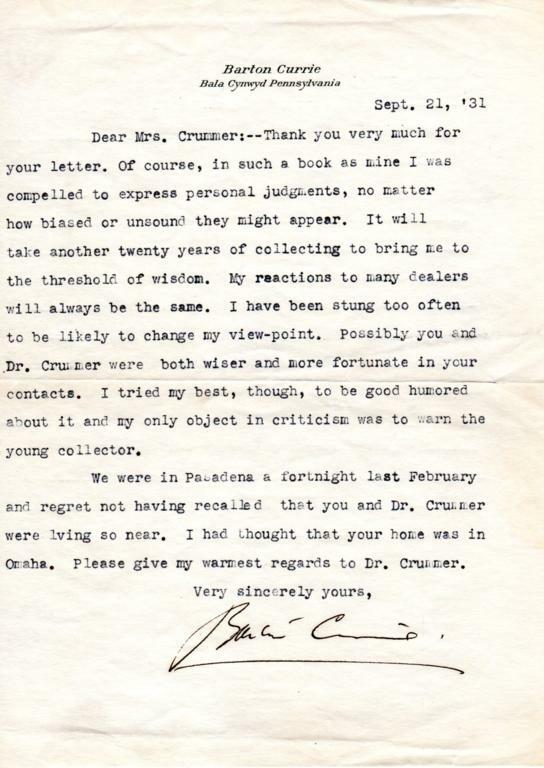 The first was plucked from a booth at the LA Book Fair. . . .
A copy of Fishers of Books in jacket from the library of Myrtle Crummer with her bookplate, rare prospectus, and a nice TLs from Currie to Crummer. Dr. Le Roy Crummer and his wife, Myrtle, formed one of the most notable husband-wife collecting duos. They had a special interest in early medical texts, manuscripts, and books. During the 1910s-1930s they formed one of the great collections in the field. Friendly rivals included eminent collectors, Harvey Cushing, Herbert Evans, and Sir William Osler. 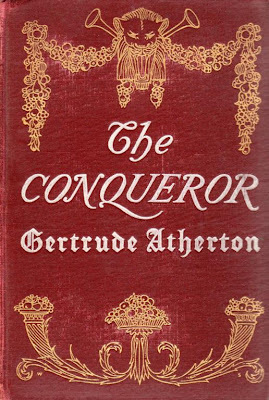 The second acquisition, Currie's copy of Gertrude Atherton's The Conqueror (1902), was quite an astounding find, ferreted out from the online book world with a what-the-heck search only minutes after reading about the very copy in Fishers of Books. That's one incredible experience that the pre-internet world never offered. Currie's description of the book collecting bug is one of the best you'll find. (Currie). Gertrude Atherton. THE CONQUEROR. New York: The Macmillan Company, 1902. xiv 546 [4, ads] p. 8vo. Decorated red cloth. Custom red morocco slipcase. 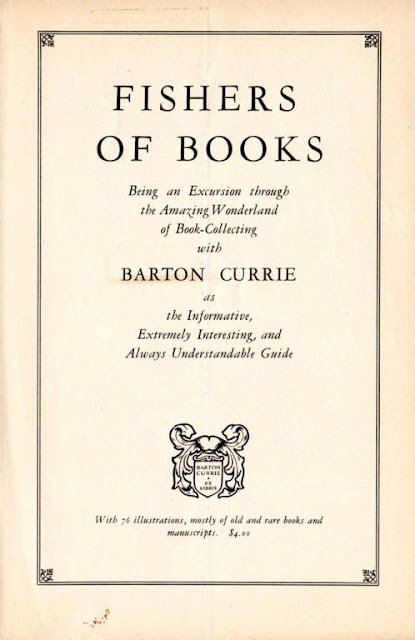 Barton Currie’s copy with bookplate. He writes in Fishers of Books, “I have endeavored to explain to at least twoscore practical and intelligent men and women why I delighted in collecting such “trash” [modern first editions]. Only an hour before beginning this paragraph I sat chatting [ca. 1930] with Gertrude Atherton on the sheltered afterdeck of the Rotterdam as she glided out of the ancient harbor of Syracuse. . . . 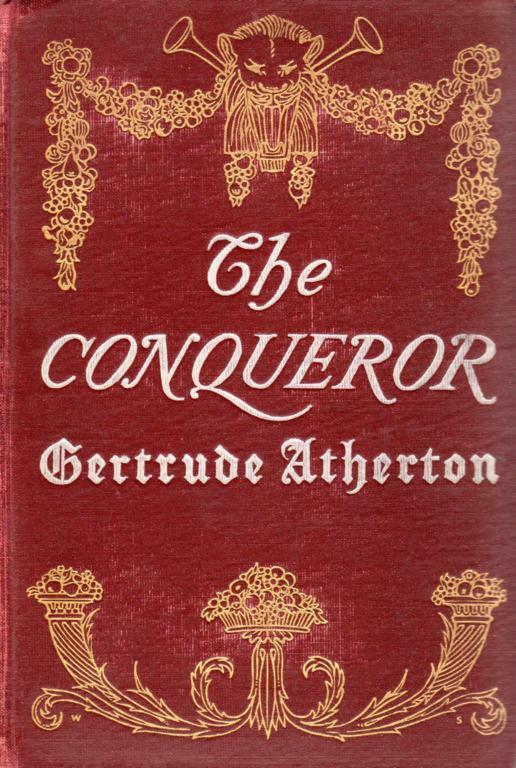 I mentioned to her that I had bought a first edition of her book, The Conqueror, and that it was such a superfine copy that I had a red Morocco case made for it. Here are a few selected Currie quotes from Fishers of Books. Much of his advice and comments remain timeless. Enjoy. The ifs in collecting greatly outnumber the certainties. But the beginning collectors are not allowed to realize this. Should they burden their minds with too many ifs at the start they would never begin. In book collecting there is the absolute necessity of digging out facts and learning at least the rudiments of bibliography. Once [the bibliophile] is in full gallop on his hobby all the rest of the world is mad save himself; moreover, he feels a vast superiority to every other sort and genre of collector. I have at least convinced myself that my efforts at collecting have been confined to only those works from which I have derived the greatest amount of enjoyment or the greatest amount of good (as I recorded it) as a reader. It has often puzzled me why so few authors of distinction collect rare books and manuscripts. You see, the innumerable ifs of collecting add immensely to the fascination of the game. Almost immediately you are smitten with the mania, you are enchanted by the uncertainties you have let yourself in for. You are keen to get to the bottom of all its mysteries. You flatter yourself that you are sharper than the majority of dubs who are collecting. Your one great and lasting regret is that you failed to start at it earlier in life, say twenty or thirty years before you made your first plunge. Said to be scarcer should be italicized for all collectors. In the majority of cases there are no publishers’ records of any kind. It will take years of looking on your own to size up degrees of scarcity—and then you may be wrong. Sudden demand can create a great apparent scarcity. . . Boswell’s “Johnson” is a book that has leaped in price from a few pounds to a thousand, not because of scarcity, but through sheer popularity and demand. The book-collecting mania has been known to peter out in old age. Rosenbach’s bitterest enemy in the trade will be forced to admit that the secret of his huge success is due largely to the fact that he has not only learned to know rare books and manuscripts as few other men have known them, but that he is capable of loving them for themselves, with somewhat the same sort of passion that possesses the rank and file of bibliomaniacs. As the insidious passion for rare books grips you tighter and tighter in its coils, you are compelled to give thought to what it is all about. Are you devoting all this time and money to the satisfaction of a purely selfish craving, like a yearning for strong drink? Only gross egotists presume to write with absolute finality concerning their own acts and conduct and the acts and conduct of others. Please do not understand me as recommending the seductive course of haphazard book buying. I advise you to plan, and to stick to a plan; I pray you to plan, or else to abandon all thoughts of first editions or any other sort of costly curiosity that is likely to ensnare the hapless victim of Bacillus bibliophilistus. Do not be misled into beginning at the top, no matter how great your means. . . Take your time and seek out first the lesser things, but be sure that they are good to fine specimens. Never quest for anything until you know—accurately—the bibliography of the item you propose to buy. Mint copies of books worth collecting are becoming scarcer and scarcer, regardless of the size of the first editions—regardless also of how they are esteemed by collectors of your day. Condition can make up for scarcity in a great many cases. To book lovers generally, whether afflicted with a mild or an aggravated form of the book-gathering disease, foraging in bookshops is an unalloyed delight. Do not deceive yourself that your popularity with a dealer, save in rare instances, will save you any money. Jot down in red ink on the first page of your book-collecting journal, if you are sufficiently industrious to keep one—that ancient rule of the British common law, Caveat emptor. I should probably have advised you much earlier in this chapter not to begin on Dickens or any other author unless you loved his works, you were a bit idolatrous in your worship of him or her. Such is probably the ideal method of collecting.